The VersAlign© is designed for the reverse-indicator method, but can also be used for the face-and-rim technique. This fixture is field proven with years of refinement. It is very rigid, highly accurate, and unequaled in its simplicity of setup. The alignment results produced are excellent every time. A 3 ½" disk contains calculation software to be used with Windows. 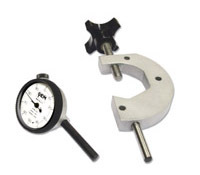 This is the only shaft-to-shaft alignment system you will ever need to purchase. 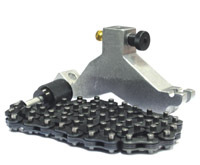 Along with the accessories, it can handle every conceivable alignment job. All that is needed beyond this fixture for alignment are mechanics' tools and shims. See below for setups. Diagnose Misalignment using vibration instruments, dial indicators, hand feel, and visual observations. 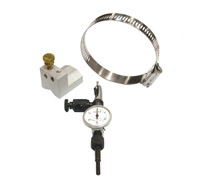 Perform Precision Alignments using dial indicators, lasers, optical and electronic measuring instruments. Graphical plotting techniques are illustrated with examples of the reverse-indicator method, face-and-rim, and many variations. Move Machines from small ones to the largest ones with orchestrated positioning techniques. 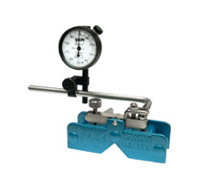 Judge Acceptability with alignment tolerances based on speed and stresses at the joints. Deal with Complicating Factors such as faulty foundations, bent shafts, soft foot, bar sag, piping strain, and thermal growth. Align Specific Machines from normal two-machine one-coupling horizontal systems, to long drive shafts, large and heavy machines, multiple machine trains, vertical shafts, single-bearing generators, and reciprocating machines. This authoritative guide also covers bearing alignments, gear alignment, and pulley alignments. It also includes specific chapters on couplings, optical tooling, and laser systems. (8) Knurled Knobs, 3/8-16 x 1" O.D. (4) 3/8-16 all thread, stainless steel, 7"
Accurately measures the actual horizontal movement. Also used to detect and correct "soft foot"
(2) Knurled knobs, 3/8-16 x 1” O.D. The Coach II Classifying Alignment Computer is no longer available. Click here to obtain IBM PC alignment manuals downloads from Acculign.